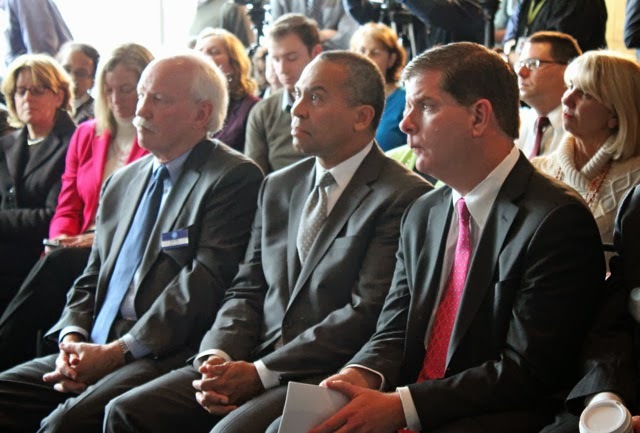 Tuesday, the Aquarium hosted a press conference for Governor Patrick to announce a new $50 million capital program to promote climate change preparedness. In an effort to minimize the impacts of major weather events, such as Superstorm Sandy in New York and New Jersey, the state is launching an initiative that would harden critical infrastructure such as transportation, utilities and critical business areas. Tap into the Aquarium's resources to learn more about climate change. Get the basics in this brief introduction to climate change. Discover the effects of climate change on ocean animals—from coral bleaching events to, possibly, right whale migration patterns, as was mentioned during today's events. Find out what you can do to make a difference for the health of the blue planet. Thank you for hosting this important event. Adaptation to climate change is vital, but so is action to lessen future release of greenhouse gasses. The aquarium can lead by installing solar and wind, improving insulation, switching aquarium vehicles to hybrids, and educating the public the minute they walk in your door. Have you started scouting out locations to relocate to, once sea levels rise and flood your current location? You have some time, but you will have to move eventually!